DB Schenker and Volkswagen, together with engineering company MAN Truck & Bus, and university Hochschule Freseniu, claim to have achieved the world’s first practical use case of networked platooning. Platooning refers to a form of vehicle automation whereby multiple trucks in a convoy use connectivity technology to allow them to act in concert. Thus, if the lead vehicle breaks, each of the other vehicles in the platoon break at the same time. In the case stated above, multiple vehicles completed the journey from the DB Schenker branch office in Neufahrn near Munich via the A9 digital test field to Nuremberg. Vehicle automation as a general concept is often misunderstood. Many immediately think of it as referring to driverless vehicles. In fact, vehicle automation is a developing technology that has been in place for some time. Automatic braking and parking are forms of vehicle automation that are already practically applied today. Platooning is the next step in a process that could lead to fully driverless vehicles, but it should not be viewed as a half-finished or half-baked technology. Platooning, within its own right, could provide enormous benefits to logistics companies. According to a study by Ertico, platooning can reduce CO2 emissions by up to 16% from the trailing vehicles and by up to 8% from the lead vehicle. Safety is another potential benefit as automatic braking from vehicles behind the lead truck needs only one-fifth of the time that humans need to react. The technology can also lead to key efficiency gains. Workers in the trailing vehicles can focus on administrative tasks instead of driving. It could lead to quicker delivery times too. Currently, European drivers are limited to nine hours driving time in a 24-hour period by law, but by alternating trucks in the lead position, logistics companies could squeeze in further driving hours, meaning freight can move further in a day (predicated on favourable legislation). These incentives are appealing to the likes of DB Schenker. Although the regular tests, which run along a 145 km are to involve empty trucks at first, in early August DB Schenker will utilise them on the road every day, making up to three routine logistics trips with part loads of, for example, machine parts, drinks, or paper. 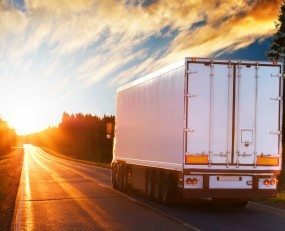 Reduction in emissions should be almost immediate, whilst further benefits for the 3PL, if not found now, could be anticipated once the driving distance is extended, as increasing the number of driving hours per day could lead to faster deliveries. As one of Europe’s largest road freight providers, Schenker is well aware of how thin margins can be in the industry. Therefore any operational efficiency gains that can be gleaned from new technology are all the more important. Platooning trials are taking place across Europe and indeed further afield, but it is significant that there has been heavy German federal involvement in this particular scheme. It has provided €2m in funding, as part of its €80m scheme to subsidise the promotion of convoy driving and the use of self-steering vehicles. The vehicle emissions scandal and cities that have broken EU pollution regulations have hit the headlines in the last few years and federal and local governments have taken steps to lessen environmental impact. Diesel bans have been put in place across many major cities. Investment in platooning is another important strand in implementing a greener policy agenda. Reducing carbon emissions, better safety and greater operational efficiency are of key importance to governments, vehicle manufacturers and logistics companies. With stakeholders pulling in the same direction, the practical application and industry-wide uptake of platooning in the short term is eminently achievable.